Chromium metal is most widely recognized for its use in chromium plating (which is often referred to simply as 'chrome'), but its largest use is as an ingredient in stainless steels. Both applications benefit from chromium's hardness, resistance to corrosion, and ability to be polished for a lustrous appearance. Chromium is a hard, gray metal that is valued for its incredible resistance to corrosion. Pure chromium is magnetic and brittle, but when alloyed can be made malleable and polished to a bright, silvery finish. Chromium derives its name from khrōma, a Greek word meaning color, due to its ability to produce vivid, colorful compounds, such as chrome oxide. In 1797, French chemist Nicolas-Louis Vauguelin produced the first pure chromium metal by treating crocoite (a chromium-containing mineral) with potassium carbonate and then reducing the resulting chromic acid with carbon in a graphite crucible. While chromium compounds have been used in dyes and paints for thousands of years, it was not until well after Vauguelin's discovery that chromium use in metal applications began to develop. In the late 19th and early 20th century, metallurgists in Europe were actively experimenting with metal alloys, trying to produce stronger and more durable steels. In 1912, while working at Firth Brown Laboratories in the UK, metallurgist Harry Brearley was tasked with finding a more resilient metal for gun barrels. He added chromium, which was known to have a high melting point, to traditional carbon steel, producing the first stainless steel. However, at about the same time, others, including Elwood Haynes in the US and engineers at Krupp in Germany, were also developing chromium containing steel alloys. With the development of the electric arc furnace, large-scale production of stainless steel followed shortly after that. During the same period, research was also being done on electro-plating metals, which allowed cheaper metals, such as iron and nickel, to adopt onto their exterior chromium's resistance to abrasion and corrosion, as well as its aesthetic qualities. The first chrome features appeared on cars and high-end clocks in the late 1920s. Industrial chromium products include chromium metal, ferrochrome, chromium chemicals, and foundry sands. In recent years, there has been a trend toward greater vertical integration in the production of chromium materials. That is, more companies are involved in the mining of chromite ore are also processing it into chromium metal, ferrochrome and, ultimately, stainless steel. In 2010 global production of chromite ore (FeCr2O4), the primary mineral extracted for chromium production was 25 million tons. Ferrochrome production was around 7 million tons, while chromium metal production was approximately 40,000 tons. Ferrochromium is produced solely using electric arc furnaces, whereas chromium metal can be produced via electrolytic, silico-thermic and aluminothermic methods. 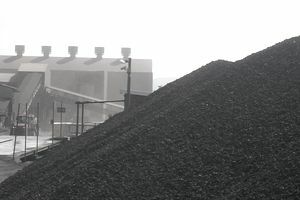 During the production of ferrochrome, the heat created by electric arc furnaces, which reaches 5070°F (2800°C), causes coal and coke to reduce chromium ore through a carbothermic reaction. Once sufficient material has been smelted in the furnace hearth, the molten metal is drained out and solidified in large castings before being crushed. Aluminothermic production of high purity chromium metal accounts for over 95% of chromium metal produced today. The first step in this process requires that the chromite ore is roasted with soda and lime in the air at 2000°F (1000°C), which creates a sodium chromate containing calcine. It can be leached away from the waste material and then reduced and precipitated as chromic oxide (Cr2O3). The chromic oxide is then mixed with powdered aluminum and put into a large clay crucible. Barium peroxide and magnesium powder are then spread onto the mixture, and the crucible is surrounded by sand (which acts as insulation). The mixture is ignited, resulting in the oxygen from the chromic oxide reacting with the aluminum to produce aluminum oxide and, thereby, liberating molten chromium metal that is 97-99% pure. According to US Geological Survey statistics, the largest producers of chromite ore in 2009 were South Africa (33%), India (20%), and Kazakhstan (17%). The largest ferrochrome producing companies include Xstrata, Eurasian Natural Resources Corp. (Kazakhstan), Samancor (South Africa), and Hernic Ferrochrome (South Africa). Stainless steels refer to a range of steels that contain between 10% to 30% chromium (by weight) and that do not corrode or rust as easily as regular steels. Between 150 and 200 different stainless steel compositions exist, although only about 10% of these are in regular use. Sully, Arthur Henry, and Eric A. Brandes. Chromium. London: Butterworths, 1954. The International Chromium Development Association (ICDA).